Aubrieta hybrida 'Leichtlinii' commonly known as Rock Cress, is a classic variety of this extremely popular and indispensable rock garden plant. A familiar sight in the spring garden, this vigorous variety forms a low cushion of evergreen grey-green leaves and freely produces wonderful deep-carmine flowers. 'Leichtlinii' has a ground-hugging habit of growth that is smothered by flowers for several months. It grows to only 10 to 15cm (4 to 6in) tall at maturity, but with a spread of around 45cm (18in) it makes a lively edging to a sunny border. A perennial favourite, Aubrieta has long been treasured for its delightful spring show of brightly coloured flowers. This dense herbaceous evergreen perennial is low maintenance and easy to grow. Hardy to -23°C (-10°F), the plant does best in full sun to partial shade and needs an average water supply throughout the season. It is not particular as to soil type, but has a definite preference for well-drained alkaline soils and is tolerant of urban pollution. Flowering April to May it only needs an annual prune each season after flowering to encourage a thick mounding habit. Commonly called ‘Rock Cress’, Aubrieta is a traditional favourite rock garden plant. Lovely spilling out of crevices, growing over rock walls or placed in stonewalls, they can be also be used in alpine troughs and containers. The plants take light foot traffic and can be used in paving or walkways with other ground hugging plants. Aubrieta is also effective when used as a flowering groundcover at the front of the border or tucked in amongst other plants. It can be used for mass plantings, they create a wonderful foil for spring bulbs and is useful for slopes and harder to reach areas. The recommended planting distance is 30cm (12in) around 8 to 12 plants per square metre. Sow in February to June or in September to October for flowering throughout the following summer. Surface sow the seeds from late winter to early summer on the top of a good free draining seed compost, in cells or pots. They need light to germinate, so just cover the seed with a small amount of vermiculite. Make sure the compost is moist and not wet and seal in a polythene bag until after germination which usually takes 14 to 21 days at 18 to 20°C (65 to 68°F). Keep in a coldframe or unheated greenhouse. Remove the polythene bag once the first seedlings appear. When seedlings are large enough to handle, transplant them to 7cm (3in) pots to grow on. Once established, plant out 30cm (12in) apart into a well drained garden soil preferably containing lime, in a sunny site. Seeds can also be sown directly in open ground. Sow a few seeds into a small prepared area. Thin out seedlings as they grow to 5cm (2in) apart. Cut the plants back severely after flowering to encourage healthy foliage growth and secondary blooms. Do not prune in autumn. Remove damaged foliage in spring. Short lived if drainage is poor or weather is too hot. Divide every 1 to 3 years. Propagate by seed, cuttings, division or separation - Cuttings are usually more successful than division. Take softwood or semi-ripe cuttings from early- to mid-summer. Remove the lower leaves and root in sand. Saved seed may not breed true to type. Suitable for rockeries, walls, borders, edging paths, planters, window boxes. Underplanting of shrubs. Aubrieta originates from southern Europe east to central Asia. It has been cultivated in gardens since 1823. It is a genus of about 12 species of flowering plants in the cabbage family Brassicaceae. The genus is named after Claude Aubriet (1665-1742), a French illustrator and botanical artist who worked at the Jardin du Roi in Paris. 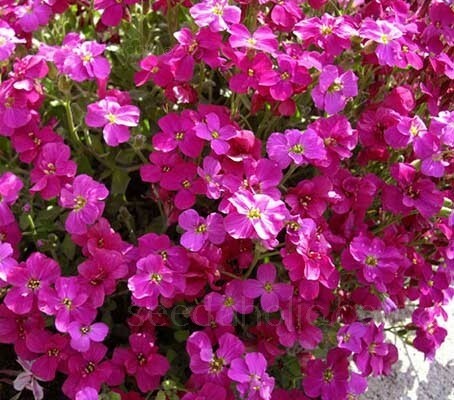 Pronounced aw-bree-EH-tuh kul-TOR-um, the true spelling is ’Aubrieta’ but in English vernacular use, the name is commonly (mis-)spelled as ‘Aubretia (or Aubrietia), an easier letter order for English speakers to pronounce. The species name hybrida indicates that this variety is a hybrid. This variety, pronounced hen-der-SON-ee-eye it is named for the early 19th century botanist, Louis Fourniquet Henderson (1853-1942). Born in Roxbury, Boston, Massachusetts, United States, Henderson attended Cornell University, studying languages and botany. He arrived in Oregon in 1877 and became a teacher at Portland High School. He became one of the first botany professors at the University of Idaho in 1893. Henderson travelled throughout Washington State in 1892 and collected over 1,500 specimens. He was hired by the Washington World's Fair Commission to create a botanical collection for exhibit at the 1893 Columbian Exposition in Chicago. Professor of botany at the University of Idaho from 1893-1909 and Curator of the herbarium and professor of botany at the University of Oregon from 1924-1939, Henderson was the author of numerous articles and monographs on plant life in the Northwest and was considered one of the most knowledgeable botanists of the northwest United States at the time of his death. Louis Fourniquet Henderson has been dubbed the 'Grand Old Man of Northwest Botany' by the Native Plant Society of Oregon, at least sixteen Northwest plant species and numerous varieties are named after him.